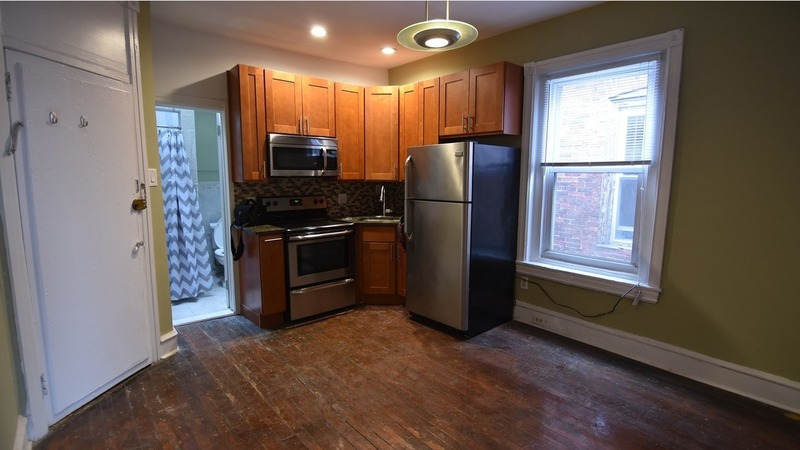 We've rounded up the latest rental offerings via rental site Zumper to get a sense of what to expect when it comes to hunting down a rental in Philadelphia if you don't want to spend more than $1,100/month on rent. Listed at $1,100/month, this 300-square-foot studio is located at 322 S. 10th St. When it comes to building amenities, anticipate on-site laundry. The apartment features carpeting, a fireplace, a ceiling fan, a breakfast bar and a spacious closet. Animals are not permitted. According to Walk Score, this location is a "walker's paradise," is easy to get around on a bicycle and is a haven for transit riders. Here's a 460-square-foot one-bedroom, one-bathroom residence at 1800 Ridge Ave. that's also going for $1,100/month. In the unit, you'll get hardwood floors, a dishwasher, granite countertops, stainless steel appliances, in-unit laundry and wooden cabinetry. Building amenities include storage space and secured entry. Neither cats nor dogs are welcome. Next, check out this 1,863-square-foot one-bedroom, one-bathroom apartment that's located at 852 Perkiomen St. It's listed for $1,100/month. The third floor unit features carpeted floors, wooden cabinetry, stainless steel appliances and granite countertops. Pet owners, inquire elsewhere: this spot doesn't allow cats or dogs. According to Walk Score, the surrounding area is very walkable, is convenient for biking and is a haven for transit riders. Located at 220 Buckingham Place, here's a one-bedroom, one-bathroom apartment that's listed for $1,100/month. On-site laundry is offered as a building amenity. The unit features air conditioning, hardwood flooring, stainless steel appliances and exposed brick. If you've got a pet, you'll be happy to learn that cats and dogs are permitted. According to Walk Score's assessment, the area around this address is extremely walkable, is easy to get around on a bicycle and has excellent transit. Listed at $1,100/month, this 1,778-square-foot one-bedroom, one-bathroom apartment is located at 1237 S. 13th St. In the second floor unit, you can expect air conditioning, hardwood flooring, ceiling fans, wooden cabinetry, built-in storage features and stainless steel appliances. Pets are not permitted.